When your cat urinates in your home outside of its litter box, it can stain fabrics and flooring, as well as leave behind a very unpleasant, strong odor. To clean this smell, you can use a natural cleaner you make yourself with fresh lemons. This way, you don't have to purchase expensive cleaners or harsh chemicals to rid your home of this unpleasant odor. 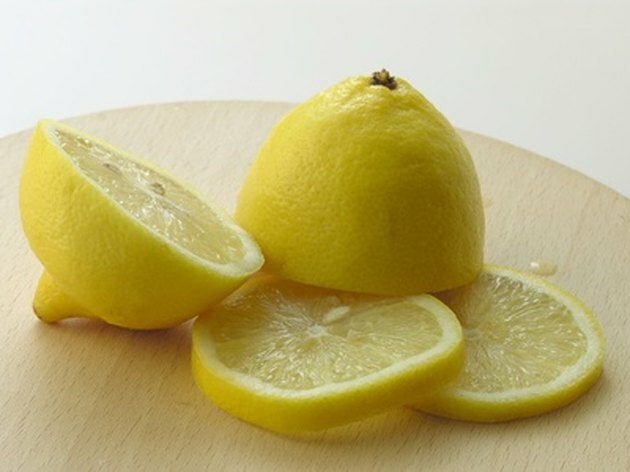 Instead, turn to one of nature's most powerful antibacterial cleansers, the lemon, to make your home smell fresh. Use lemons to clean away cat urine and deter re-marking. Absorb as much of the cat urine as you can by blotting the stain repeatedly with paper towels. Replace the paper towels with new ones if the urine soaks through them. Continue to blot up the liquid by applying pressure until the paper towels do not absorb anymore liquid. Wet older stains with a little warm water. Cut 12 lemons in half and juice them. Strain the fresh juice to remove any pulp or fruit particles from the juice. Add 2 to 3 tsp. baking soda and 1/2 tsp. salt to aid with odor removal and scrubbing power of the cleaner. For use on delicate fabrics or darker carpets, dilute the lemon juice mixture with a cup of warm water. Pour the lemon juice mixture on the urine stain and use a scrub brush to work it into the surface or fabric of the stain. Allow the juice to sit for 15 minutes. The lemon juice has antibacterial properties that will kill the bacteria in the cat urine, eliminating the smell. Rinse the surface or fabric with warm water and blot up the water and lemon juice with paper towels. Continue to blot up the liquid until you have dried most of the area. Brush away any remaining baking soda and vacuum it up. Repeat the application of the lemon juice solution and rinse with water, if the stain or odor persist. Cats will not re-mark this area as they do not like the scent of citrus or lemons. Remove tougher stains by mixing the lemon juice and baking soda with 1/2 cup hydrogen peroxide (do not add water). Apply this to the stain, scrub, and rinse with water. Blot up any remaining solution.